Dancing Forest by Sam Cooler We aspire to facilitate fluid, free-flowing nonverbal communication and simple genuine interactions. We’re inspired by the fluid energy of creatures in forests, cells and networks, and how they come together to form a greater whole. We’re fascinated by wind-shaken tree trunks, blissful group dancing, gymnastic exuberance. We built a piece that is fun, big, sturdy but flexible, visually interesting to observe, and engages old friends and new in active participation. 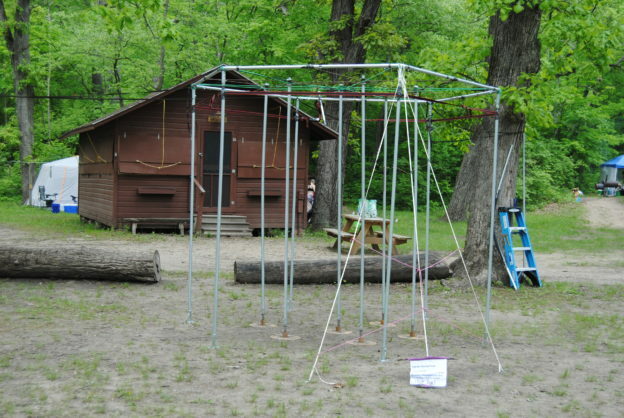 We want to climb and bounce and swing and play. This is an art that dances with you. Vertical poles facilitate horizontal interaction; they act as center points of rotation in a vector field. 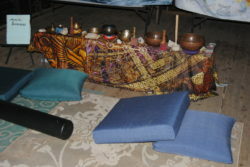 Moving one moves the others, and communicates vibration and oscillation through personal and physical links. 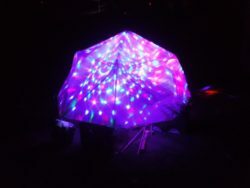 Disco Turtle by Ryan McAdam and BenmeR Turtles do like to dance, or at least the light up when dance music happens. I’ve seen it! It is also not nice to hang a turtle from the ceiling, so this Turtle Disco Ball sits on the ground near the Lodge and lights up to the sounds of the Music performed. Green Illumination by Doug Peters The large outdoor art installation of Brilliantly Blooming Woods helps transform outdoor areas into magical, visually stimulating spaces, both day & night. 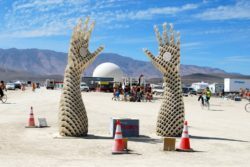 Green Illumination seeks to transform these Burning Man art installs into safe & sustainable lighted works with a simple portable power station (battery & controllers) & flexible solar panel charger. 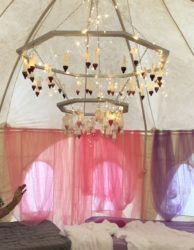 Junicorn’s Shell Shining Station by Julia Rochholz Ever engaged with illuminating inner beauty through outer expression. A plethora of body painting materials and accessories to share with everyone. This space is to be interactive with materials. We all need a little shell shine now and again! Pyrobox by Matthew Waugh The Pyrobox is a 3D fire/sound visualizer. Propane is pumped into the box through the holes in the bottom of the box and ignited when it comes out of the holes in the top. The holes on the sides of the box connect to two pipes at the end of which are speakers both of which are sealed with rubber. The speakers play music into the box which compress and expand the gas according to the frequency of the sound and result in compression and expansion of the flames coming out of the top of the box. The flames will dance and move with the music. 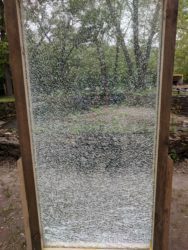 Shattered World View by Gavin Miller Inspired by the random patterns and light distortion created by cracking and breaking of glass, I created a framed, two-sided installation for viewing the chaos of fractures, and the distortion of objects seen through the installation. 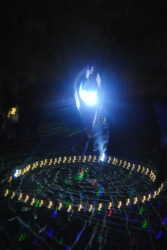 The piece is illuminated by sunlight during the day, and self powered/illuminated at night. BBQ arts, and create a platform for participants to create their own smokey deliciousness to share. The kitchen is where we gather to nourish our bodies and be together. The hearth is where we warm ourselves. Food has an incredible power to unite people, as it’s something we all have in common, and all enjoy. We seek to facilitate community through the shared enjoyment of food. RhomBunctious is a fun, interactive playa structure that brings the geometric beauty of the golden ratio to life. Straight from the notebooks of Leonardo Da Vinci, this installation provides a visual, tactile, and interactive environment for burners to inhabit, climb, and lounge upon. This archimedean solid is made of 18 squares and 8 triangular faces which combine to create a complex and beautiful geometry. Each component is a modular unit, assisting in construction as well as aesthetic beauty. The module parameters are based upon a human-scale, the square’s width corresponding to the length of a human’s shoulder width and the height corresponding to a human’s wingspan. The RhomBunctious’ human relatability will demonstrate the way the divine proportion dictates a human’s anatomy, creating a stunning example of anatomical beauty dictating the scale of the architectural form. 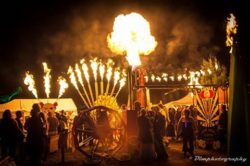 Our primary goal has been to bring theater through fire – interacting with the crowd, creating ways that people can particapate and play with fire and with our carnival. More than that, it’s an opportunity for us and the audience to explore what can be done by combining poofers with technology and carnies. But perhaps best of all is our desire to inspire people – to see and be a part of magic in our everday lives. In our off hours, we’ve been working towards offering different kinds of classes, starting with welding, to help teach and inspire others. ferent flaming bean-bag games, life-sized operation, the he-man classic High Striker, and hope to add a new wheel of chance, flaming Whack-A-Mole, and a grand new entryway. Games will be attended by Carnies and Barkers, engaging the crowd to step up and play! to become more immersed in the piece. 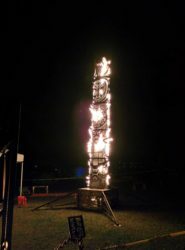 Shaft and Scroat – an interactive flame effect and naughty darts game. 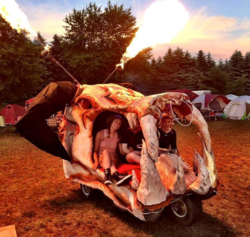 The League of Troubled Souls seeks to create a piece that will achieve a giant flame effect of high aesthetic quality, making it unique in the Great Lakes Region. The Touchy Duchess towers above supplicants, haughtily beseeching them to give her pleasure. She is not amused when participants fail to skillfully manipulate her, and her tongue is as sharp as her metallic visage. 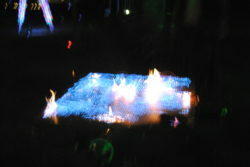 Participants who properly co-ordinate their effort, however, are rewarded with a fearsome spray of fire from the top of her head. Fungus Humongous is an installation created for Resonate and Burning Man. Will you be one with the fungus or float away like a jellyfish? 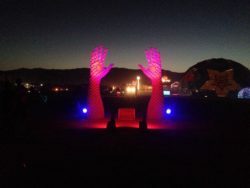 Participants were invited to relax, play, and draw in this touch- and sound-reactive colossal interactive sculpture. 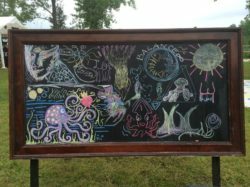 A participant creates a drawing on the glow boards.